Each hexagon has different gauge. All patterns are written in US terms. Each clue will be released in 1 PDF. That means clue 2 will be added to clue 1, clue 3 added to clue 2, clue 4 added to clue 3, clue 5 will be added to clue 4. You will know what clue it is by the name of the PDF. When all 5 clues have been released the PDF name will only say the title of the pattern - no clue numbers. For the month of April 2019 - each week I will be releasing 1 hexagon. A small CAL of sorts if you would. 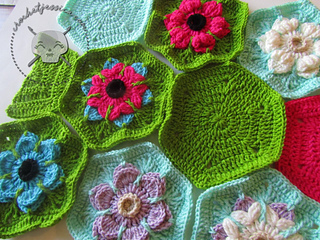 There are 3 floral hexagons, 1 plain hexagon, and 1 plain half hexagon. Sometimes in March 2019 a introductory PDF will be released as well being put on my site.